T he /Ai-/Ais Hot Springs and Fish River Canyon were first proclaimed in 1968, and in 1989 the Huns Mountains complex west of the canyon was added to these features to form a single conservation entity. The Namibian Government acquired several farms in the surroundings, which were also incorporated into the unit, and in 2003 the long-term conservation objective to manage the Huns Mountains and /Ai-/Ais Game Park jointly with the Richtersveld National Park as one integrated Transfrontier Conservation Area (TFCA) became a reality when the /Ai-/Ais-Richtersveld Transfrontier Park became Namibia’s first transfrontier conservation area. The attraction of this rugged wilderness is its isolated and otherworldly landscape, and wealth of interesting xerophytic plants, such as the halfmens or elephant’s trunk, Pachypodium namaquanum. 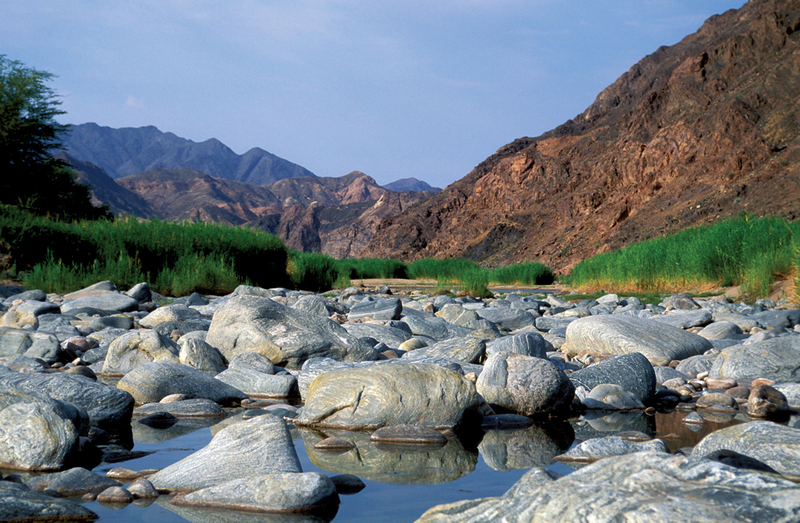 Geologically and botanically the area is similar to South Africa’s Richtersveld south of the Orange River. Eroded over many millennia, the Fish River Canyon is the second-largest natural canyon in the world. 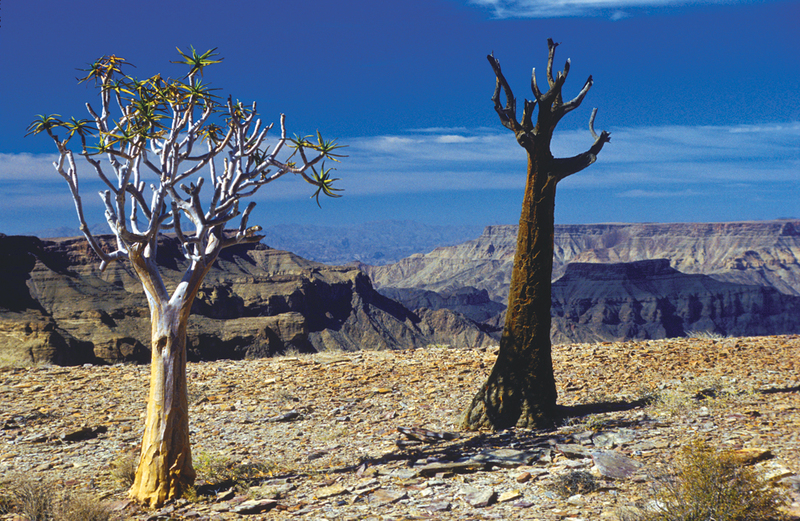 Set in a harsh, stony plain, dotted with drought-resistant succulents such as the distinctive quiver tree or kokerboom, Aloe dichotoma, and Euphorbia gregaria, the canyon is a spectacular natural phenomenon that took hundreds of millions of years to evolve. While its full length is 160 km – the width is up to 27 km and depth up to 550 metres – its most spectacular section is the 56-km stretch between the northernmost and southernmost viewpoints. Because the river flows inter­mittently, there is always water in some of the pools, except in very dry years. Containing small- and largemouth yellowfish, sharptooth catfish, tilapia and common carp, the pools are also frequented by the water monitor or leguan. Baboon, rock hyrax, ground squirrel and klipspringer are often seen in the canyon, while the presence of leopard and mountain zebra is indicated by tracks left at waterholes. Kudu inhabit the densely vegetated lower reaches north of /Ai-/Ais. An interesting variety of birds, such as the olive thrush, Cape robin-chat and African black duck, are found in the canyon. A new, N$1.6-million enviro-friendly viewpoint overlooking the spectacular Fish River Canyon was completed in 2010. Designed by Windhoek-based architect Nina Maritz – who is internationally recognised for her expertise in energy efficiency and sustainable building within developing countries – the new facility greatly enhances this popular southern destination. Displayed at the viewpoint are a series of interpretive information posters for tourists, providing information on the flora, fauna and geology of the canyon, the history of the area, the human footprint, the transfrontier process and the Fish River Canyon hiking trail.